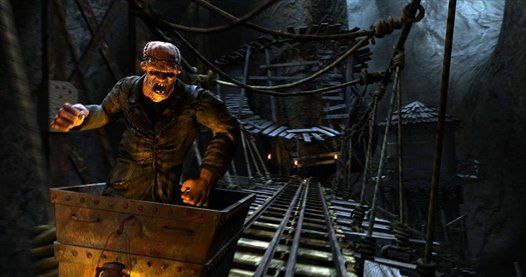 Hurtle down an abandoned mine railroad to escape the clutches of Dr Frankenstein’s monster! With seats that move with the on-screen action, you’ll feel like you’re really hurtling down an abandoned mine railroad to escape the clutches of Dr Frankenstein’s monster! At the end of the line you’ll tumble into a spooky graveyard for a final showdown with the monster. Please note: some children may find some scenes in the film scary. We recommend parents and guardians watch the film in advance to make their own judgement on whether this is suitable for the child in their care. Click here to watch the video. You must be at least 1.2 metres in height to use the 4D Motion Ride. During busy times, we request that you visit the planetarium, Science Theatre and Motion Ride once – this is to allow other visitors to enjoy the experience too. Thanks for your consideration.